What do Donna Summer’s ‘I Feel Love’ and New Order’s ‘Blue Monday’ have in common? 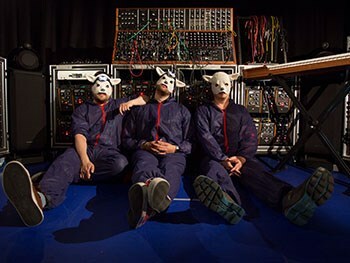 Apart from being smash hits, their hypnotic melodies are a tribute to the electronic music pioneer Robert Moog. With a reputation for genre-bending sound and performance, Supersonic Festival has chosen to mark the 10th anniversary of Robert Moog’s death in this year’s festival, with a very special Moog Sound Lab Residencies hosted at Birmingham City University. This exciting collaboration is part of the University’s world-leading research output in the areas of Art & Design, English, Media and Performing Arts. Matt Grimes, Senior Lecturer in Music Industries and Radio at Birmingham City University said; “When Robert Moog unveiled the Moog synthesiser to the world in 1964, he not only radically changed music, but culture itself. Twelve cutting-edge artists have been selected to take part in the Moog Sound Lab Residencies, taking place at Birmingham City University’s Parkside building. The residencies will see artists spend between one and three days witha collection of rare synthesisers and equipment such as a System 55 Moog Modular with Keyboard,Slim Phatty polyphonic towers, and Minimoog Voyagers. Some of this equipment is very rare and expensive, with one piece valued at over $35,000. The residencies will run between June 15 – 25.